Our digital world is increasingly departing from the screen, finding its way into our everyday life-scapes. These new forms of technology are coming alive, infiltrating our physical environments and bringing new forms of communication with it. Dutch artist Daan Roosegaarde has found his niche in this updated reality; through his illuminated environments. Roosegaarde endeavours to merge nature and technology, finding new ways of translating our actions onto our surrounds and reforming our environments with light. This talent was demonstrated in an illuminated spectacle throughout February, above a flood channel of the Netherlands’ River Ijssel. 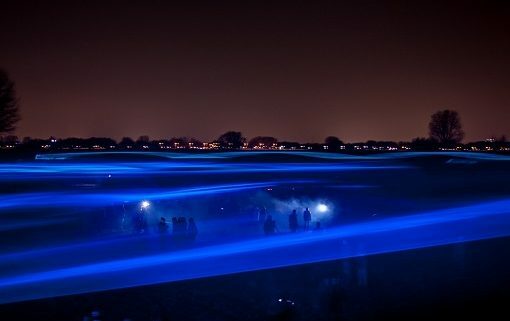 Roosegaarde’s project Waterlicht (or Waterlight) was a 4 acre installation for the Dutch Water Board, using the latest LED technology to realise a flood, brought to life in light. The work was something akin to a man made aurora borealis – the natural phenomenon created when charged particles enter the Earth’s atmosphere. 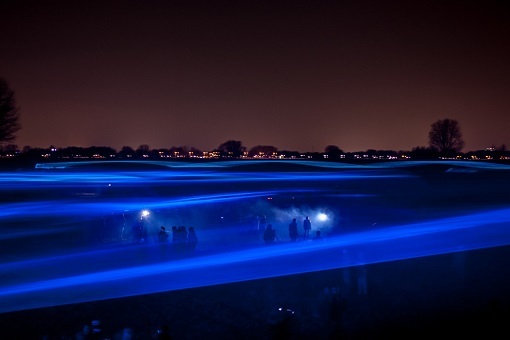 “Walking on the dyke the light lines are perceived as high water, once in the flood channel you find yourself in an underwater world,” said Roosegaarde. The sensation of ‘flood’ was achieved through undulating lines of light catching the fog rushing above the heads of the visitors. The installation used LEDs that were projected through lenses to focus the light, spanning great distances. The beams were positioned so as they would criss-cross in midair as they slowly move up and down, powered by motors. The light sources were installed around the periphery of the flood channel, three meters high, providing spectators with the sensation of walking just beneath the water’s surface. Roosegaarde paints in the darkness, creating almost invisible, ephemeral and virtual artwork. Beyond a new way of highlighting existing elements in space, he provokes his audiences to think across different timescales and virtual scenarios. Information begins to embed itself in our physical existence, beyond the screen, washing over us as a form of dreamscape. Perhaps our new virtual reality is a state that is inseparable from our surrounding environment, built with light. Plug-in to latest trends. Subscribe to our Newsletter!